DiSano, Barbara M., 80, passed peacefullyTuesday(12/15/2015) surrounded by her loving family at Berkshire Place Nursing Home. She was born in Woonsocket a daughter of the late Joseph and Muriel (Owens) Koger, and had lived in Cranston for many years. She was the wife of the late Charles Mello, Sr. and Louis M. DiSano. The family would like to thank the staff of Berkshire Place for the care and dedication given to Mrs. DiSano over the last several years. Mrs. DiSano was the mother of four, 2 daughters; Cheryl (Mike) Matarese of Durand, MI and Lisa (Edward) Hardy of Cranston, a sister Judith Rego of Warren and a granddaughter Ashley Hardy CPD. 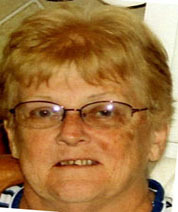 She was the mother of the late Charles Mello, Jr. and sister of the late Joseph Koger.